STAND 4 LOVE is an awareness charity project to promote the visibility and rights of Gay, Lesbian, Bisexual and Straight loving couples to have the right to marry and be recognized by the law across the world. It will be a picture campaign in Second Life to spread awareness and promote equality and tolerance. 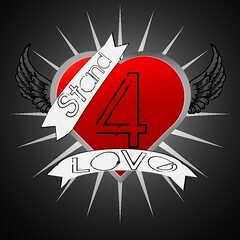 Each participant will take a picture of themselves in a plain white or black background then add the Stand4Love Logo. They will then put their message of support as well as their SL name and/or Title/Business (Optional) in the picture. All pictures received will be published here in this blog. It will also be promoted in Stand4Love Facebook page and Flickr group. Please Join us. Its time!Everyone deserves the right to love who they wish! There is so much hate and pain in this world that we CAN’T stop.This is something we can change.I have on my profile that I will step in when I see any kind of bullying.Im the same in RL. * I promise to Stand up for Love!!! !